Our family has been enjoying delicious pancakes, waffles, bread, pizza crusts, and English muffins (click here) made with my homemade sour dough starter. It has opened a whole new world for me, since several of us are gluten intolerant. If you use a fermentation process, it helps to break down the phytic acid which is the cause of most digestive issues for people. Making your own sour dough starter is really not as hard as you may think. What helped me the most in getting and maintaining a strong starter is the addition of using rye flour as well as white unbleached flour. I like the King Arthur flours, but I don’t alway have it on hand. If you’re following THM diet plan, you can only use white flour to FEED the starter, but not when you go to bake with it. The reason you can use it to feed the starter is because it will only be a minimal amount in your whole recipe and the sourdough eats up the natural sugars and breaks down the phytic acid, making it easier to digest. It works similar to using regular sugar while making Kombucha. Note: To keep it THM compatible, make sure to wait at least 8-12 hours to use your starter after you’ve fed it. As in my recipe for the English muffins, I always mix the starter, flour, and milk (or water) the night before I want to bake it and leave it set at room temperature. This provides a longer fermentation period to make sure it is THM approved. Also, baked things like bread and cinnamon rolls need to set out a few days to become more active. Take the amount of starter you need and set it at room temperature and feed it more frequently until it rises well and is thick and bubbly. You should be able to see lots of air pockets when you pull some back from the sides. *Make sure not to use ANY metal utensils or bowls with your sour dough starter. I hope you enjoy working with your sour dough starter as much as I do! 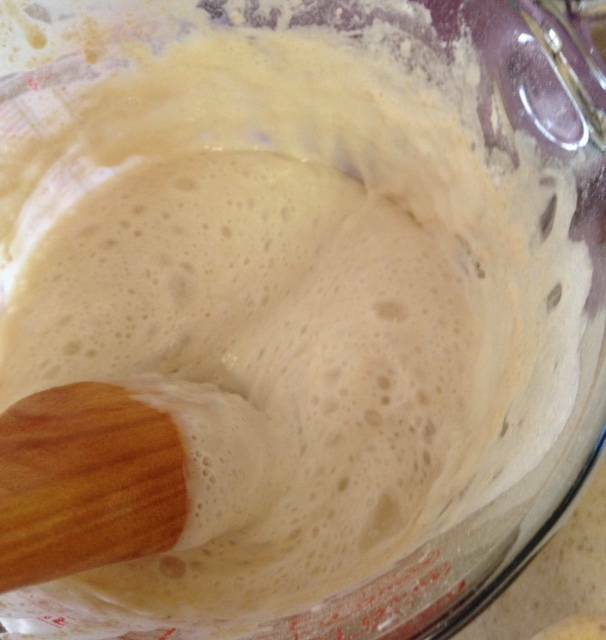 Using a spatula or plastic whisk, mix the flours and water until flour is completely dissolved. Place in glass jar and cover lightly. (Always prevent metal from touching your starter.) Set in a warm area of your kitchen. In a separate container, combine a mixture of 1/4 rye flour to 3/4 amount of unbleached white flour for future feedings. The amount you mix doesn't really matter, but you will then use from this to feed your starter each day. At about the same time the next day, feed your starter with 7 and 1/2 t. of the flour mixture and a bit less than this amount of water. (Maybe around 6 and 1/2 t. of water.) Stir with spatula or plastic whisk. Feed your starter about the same time each day. It's important to keep the same ratio of starter, flour, and scant less water. (Example: If you have 1/4 C. of starter, you will feed it 1/4 C. flour and scant 1/4 C. of water.) At this point, you may want to measure your starter in a plastic measuring cup and keep it at around 1-2 cups until it is properly fermented. You can simply discard the extra. By day 5, you should be able to see bubbles forming and it getting bubbly. It may smell a bit like vinegar. It has been "catching" the yeast from the air, especially from other food, fruit, etc. from in your kitchen. If your starter is now looking quite bubbly on top, it is ready to be fed twice a day. Feed it at the same time you've been doing it and then feed it again 8-12 hours later. By this time, you should be able to see a definite rise and fall after you feed it, and it is ready to be used. I suggest you begin becoming familiar with your sour dough starter by making pancakes, waffles and English muffins with it. Don't forget to always keep aside some of your "mother" starter for future baking. Yes, Kerri, it does! I will go back and clarify that. Thank you for asking! Thank you so much for such a clear, easy to understand recipe for a starter. I followed your instructions, and am on day 3 and it is bubbly already! Thank you !! That’s wonderful, Keila! Glad it’s doing well for you. What do you do if you’re not around to feed it, like leaving town for the weekend? Would you explain a little more what you mean by “lightly covered”. Does this mean don’t put the glass lid on?, cover with a piece of cloth?, I’m always confused about this part. I recommend beginning this project when you’re planning on being at home. If something comes up unexpectedly, feed it just before you leave and put it in the refrigerator. When you get home, take it out and pick up where you stopped. It should be fine, but I can’t say for sure. (I think it will depend on if it had time to catch some yeast before you needed to refrigerate it.) You may need to feed it several days longer in order to get it good and active. Hi, Brenda! It just needs a napkin or paper towel on top. The only reason it needs a covering is to prevent bugs, etc. from getting inside (and just feels a bit strange leaving something like that completely uncovered!) You can put a rubber band around it to keep it from slipping off if you want. Can I start with rye white flour and whole wheat instead of regular rye and white flour? Thank you! could you give me a recipe for bread or cinnamon rolls? Every THM recipe for sourdough i see is for one that doesn’t use a starter. Yes, Carol, that should work fine. Hi Julie. I don’t have my bread and cinnamon roll recipes posted on here yet. Sorry! I know I really need to do that… Have you seen my pancake/waffle and English Muffin recipes though? I’m very UNSKILLED when it comes to making and using sourdough, so please forgive, but after 7days you would only have used about 64 t. Of flour….when you use it to bake some thing, do you add just regular flour? I put mine in a large jar and it spread out and got a little hard on the edges. Thank you for your answer. I guess I misunderstood….I am on day 4 and was only adding 7 1/2 t. Flour and 6 1/2 t. Water each time and not measuring before feeding. I think I understand now. Will try again. Thank you! I didn’t know you were allowed to use white flour in THM. ?? I received a sour dough starter that has been around for about 8 years. I am gluten in tolerate and on the THM lifestyle. My question is what type of flour do you feed it, bake with and what recipe do I use to stay in the THM lifestyle to have wonderful sour dough bread? If I store it in the fridge, and only feed it weekly, do I need to take out my required amount for making bread and set it out on the counter overnight? I’m assuming I cant use it straight out of the fridge right? Hi Cindy, I started my first sourdough starter on saturday!! And my question is…yesterday it formed a brown liquid on the top. This morning I poured it off and now today it is there again. Is this normal? We are living in Grenada with no a/c and the weather is very warm, could that be affecting it? The first 2 days it was nice and bubbly and now it seems more “heavy”. Hello, Lydia! Yes, with being in a place like Grenada, the starter will getting very “hungry.” I would start feeding it twice a day and it should become active. The brown liquid (hooch) just means it needs to be fed more often. If you just dump that part off, the rest of the starter should be fine! I think I may have messed up all ready and I’m just starting! I’m on Day 2 and just realized I put the lid on the jar instead of covering with a paper towel. Oh my! Should I start over? Also, I don’t know if my white flour is unbleached. Is that very important? Hi, Kathy! I don’t know that either of these (lid on the jar, and bleached flour) will totally ruin it, but if you’re only on Day 2, my recommendation would be to start over especially because of the lid being on the jar. How much bleached flour affects starter is a bit controversial…I would use unbleached flour if possible, as some say bleach affects the quality of starter, but that is really up to you…I don’t think it will completely ruin it. Don’t let this discourage you…you’ll be glad you kept up with it! It’s really easy to maintain once you get it going. Best of wishes in this! Thank you for your advice, Cindy. I took it and am starting over! I’d rather have the best quality and wait a few more days! Glad to here it is easy to maintain once I get it going. That’s encouraging. At what point can I put it in the fridge and just feed it once a week? Do I have to get it out the night before if I’m going to make pancakes or do you just do that when you make bread? Hi, Kristina! When you see a distinctive rise and fall after your feedings (about day 6 or 7) the starter is ready to use. The instructions for the sourdough pancakes tells how to use the starter (http://www.themullettfamily.com/recipes/fluffy-sourdough-pancakes-thm-e/) but yes, you do set it, along with other pancake ingredients set out at least 7 hours. Once you can tell your starter is active, you can refrigerate and only feed weekly. For sure by day 10 you can feed weekly (and it can even survive longer than that). Hope this helps to clarify! Hi again Cindy! I have made some amazing english muffins and delicious pancakes from your starter. This is my question: How do I increase the amount of starter so that I can make things more often? If I keep it in the fridge and feed it once a week, I never seem to have enough or only enough to make one of these things. So last week I thought well maybe if I take it our of the fridge and feed in twice a day (every 12 hours) I will increase my sourdough starter. I did this but then chickened out and was afraid I was ruining it and ended up putting in back in the fridge but it seems to be getting that brown liquid on top a lot. Could you share your wisdom and experience on this. Thanks in advance! That is very helpful City and reassuring! So if I have a cup of starter I feed it a cup and then a little less water and I keep doing this twice a day increasing the feeding amount to the amount of starter. Right? And that is why you are saying it will overtake me if I leave it out on the counter too long. Just curious (total newbie), why do we need to keep metal away from the starter? Great question, Nancy! Sourdough is naturally acidic and long exposure to specific metals can damage it. It’s best to to glass or plastic. But brief contact with metal shouldn’t cause detrimental effects to the sourdough.